The Creeping Buttercup is a low growing perennial weed which prefers wet heavy soils. Creeping Buttercups spread with vigorous creeping stems that run along the ground rooting at intervals with a very fibrous rooting system. 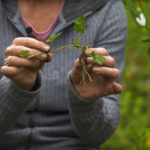 You need to make sure you remove all the fibrous roots as well as the main part of the weed, as this tricky weed will just keep coming back if any is left behind.